In the memory and honor of my father, I would like to initiate the O.K. 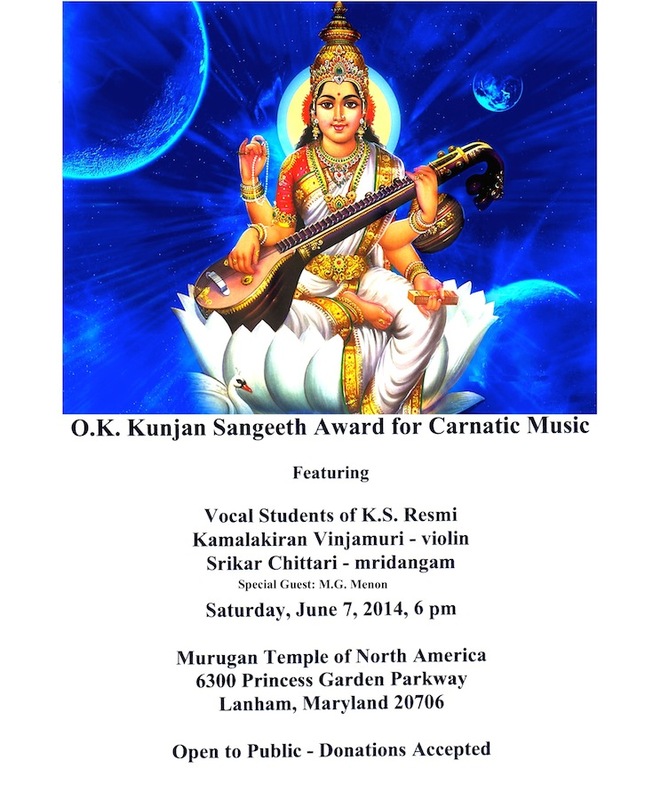 Kunjan Sangeeth Award for Excellence in Carnatic Music, starting with 2014. This award will be presented at the First Annual Day Recital, scheduled on Saturday, June 7, 2014. The Annual Day Recital will be conducted at the Murugan Temple of North America, located at 6300 Princess Garden Parkway, Lanham, Maryland 20706 USA. It will begin at 5 PM. Rehearsal dates and location are below. Please mark your Calendars! Accompanying musicians: Kamalakiran Vinjamuri – violin Srikar Chittari – mridangam REHEARSALS: Fridays at 6 PM on May 30 & June 6 – All students and accompanying musicians Sri Siva Vishnu Temple – Aakaar Room 6905 Cipriano Road, Lanham, Maryland 20706 USA The Annual O.K. Kunjan Sangeeth Award for Excellence in Carnatic Music is comprised of three cash prizes. The prizes will be awarded as follows: The First Place Winner will receive $251.00, a Certificate of Achievement and a trophy. The First Runner Up will receive $151.00 and a Certificate of Achievement. The Second Runner Up will receive $101.00 and a Certificate of Achievement. My father, O.K. Kunjan, was born on December 10, 1942, in Kerala, India. He was a great teacher, very charismatic and beloved by his students. He was involved in social work and youth festival committees, volunteering his time and energies to help those less fortunate and to elevate underprivileged children to realize their potential and grow their special talents. 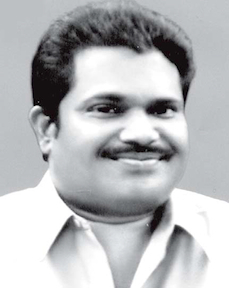 He had a special appreciation for music and inspired me to pursue a career in Carnatic Music. The Participants: All my current students. The prizewinners will be chosen for their extraordinary hard work, commitment, and passion for Carnatic music. Requirements: Students must practice everyday and perform at an exemplary level during their weekly sessions with me and participate in the annual performance. Prize Selection Process: Prizes are based on practice and performances throughout the year. Students unable to be present at the Annual Recital due to distance may submit a video taped performance, which will be viewed.